Chromebooks continue to grow in the market, and with the upcoming Google Play app support on ChromeOS, this is a good time to consider getting a new model or your first model. The feature is just launching, so it’s a good idea to buy a model with 4GB RAM and a touch-screen since Google Play apps are touch-optimized. There are a handful of compatible models already, but if you prefer a “latest model”, there will be a few coming out in the run-up to the 2016 holiday shopping season. Which brings us to the brand new Acer Chromebook R11 with a pre-order price of $300 at amazon.com. The release date is not yet known. It has 4GB RAM, an 11.6-inch touch-screen but unfortunately with a 1366×768 resolution, and it is powered by Celery 🙂 Okay, the Celeron N3150 quad-core processor which currently ranks #1249 at cpubenchmark.net. Acer wisely resisted the temptation to just stick a USB-C port. Instead you get one USB 3.0 and one USB 2.0 full size ports, along with HDMI output. Storage is 32GB on-board, along with an SD card reader (and of course the two USB ports and anything else you can connect via Wifi or Bluetooth or Ethernet-over-USB). But that’s not all, part of the reason for the $300 starting price is that this is a convertible. The screen has a 360-degree rotation, so you can do the classic “tent” and “netflix and chill” angles, or fold the keyboard under the screen and turn it into a big tablet. Which would be even more handy when the Google Play apps come in! If you want to test Google Play apps on a Chromebook RIGHT NOW, and you can’t wait for new models coming in the fall, and you are cool with playing with the development channel builds, a second existing Chromebook has joined the ASUS Flip. It is the 11.6-inch Acer R11, also a convertible with a touchscreen, but unlike the 10-inch ASUS, this one has a larger screen. The prices are close enough at the moment, the Acer R11 is on sale for $259 with free shipping, with a limit of three units per customer at Amazon.com. Unfortunately this is only available with 2GB RAM, so that’s something to consider depending on how much you multi-task and what type of websites you visit (or if you use Chrome extensions that kill off most of the CPU waste (Flash, Annoying Ads, pointless widgets, etc)). Other than that, it is powered by the Celeron N3150 (ranks in the 1200s at cpubenchmark.net), unlike the Rockchip of the ASUS. However, the ASUS has 4GB RAM. Other specs include a couple of USB ports (one is 3.0), HDMI, SD card, Bluetooth, etc. The screen is an IPS 1366 x 768 touchscreen. Touchscreen being the critical part since most Android apps are optimized for the touch user interface. Having said all that, if you are not in a hurry to try ChromeDroid apps right NOW, you are better off waiting to see what the Fall Laptop Season brings. Then you can either get newer/better models or you can find bigger discounts on the existing models. In a sea of Chromebooks, the ASUS Flip managed to climb to star status without actually doing anything. The reasons for its claim to fame are existential, it’s the only Chromebook at the moment that is capable to receive Google builds that allow it to officially run Google Play apps. Google is working to make this feature mainstream, and more new Chromebooks will come out in the next few months/years that are optimized for this. But if you don’t want to wait until then, and you want to boldly try out Google Play on Chrome OS right now, the ASUS Flip is where it’s at. Which means sales are going to be harder to come by for it, and smaller discounts will be the norm until competing and better models are released. To cut a long story short, the 4GB RAM with 16GB on-board storage model is currently going for $265 with a limit of three units per customer at Amazon by Amazon actual. This has a 1280 x 800 IPS touchscreen, flipping all the way to touch the back of the keyboard to form a “thick tablet”. This has a Rockchip quad-core processor. Speaking of budget laptops, on the Chromebook side of things, if you are fond of the 15.6-inch form factor, there is a sale on the Acer Chromebook 15, model CB5-571-C1DZ, going for $230 with free shipping at Amazon by Amazon actual. This comes with a nice 4GB RAM but only 16GB on-board storage which can however be augmented using the two USB ports, the memory card slot, and of course the cloud. The screen is a 1080p IPS, but not a touchscreen. It is a Celeron powered model, it has the Dual-Core 3205U which currently ranks #1239 at cpubenchmark.net. The review average is 4.4 out of 5 based on almost 500 of them, but multiple variations are clustered together in a single review page. The options 2 or 4GB RAM and 16GB or 32GB SSD, and Accessory Bundles (mouse and bag). … this brings us a new sale at MacMall, they are offering the new condition HP Chromebook 11 G4 for $150 with free shipping. Despite the low price, this has 4GB of RAM, which it is starting to become almost a must-have if you are planning to use a Chromebook for more than unitasking and visit many commercial websites. 11.6-inch TN non-touchscreen with 1366 x 768 resolution, card reader, HDMI, USB ports (one 3.0, one 2.0), Bluetooth 4.0 (remembers way back when ChromeOS did not support Bluetooth Audio??? ), 802.11ac, and such. The ChromeOS is a fairly lightweight operating system, but the same cannot be said for today’s web as websites get bigger and bloat-ier, especially the bigger page-view driven websites. 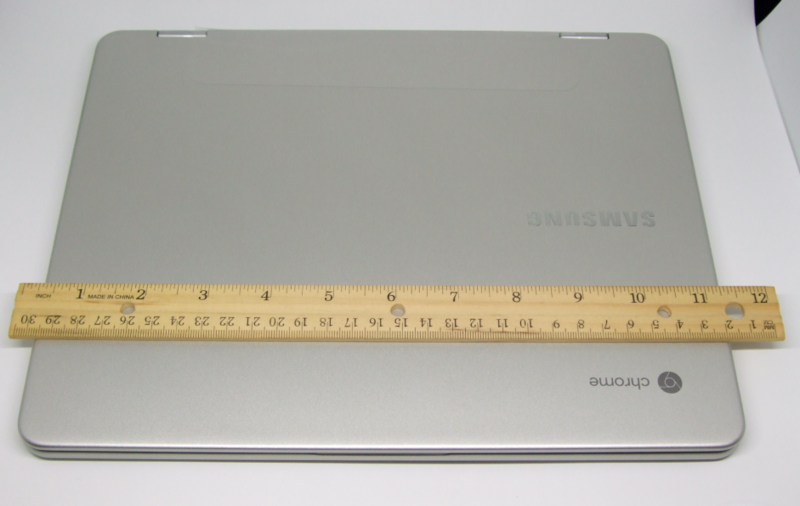 So a Chromebook with better specs may be needed to keep up with the website growth (more than the ChromeOS bloat). Which brings us to the 4GB version of the third generation Samsung Chromebook, model XE500C13-K02US, currently on sale for $200 with free shipping at Amazon.com. This is only $20 more than the 2GB model, and that $20 is definitely worth it if you are browsing more than one website at a time. Other specs include 16GB of on-board storage (but cloud and USB ports can give you a lot more storage), the budget 11.6-inch 1366×768 screen resolution. It is eating celery, which is a roundabout way of saying it is powered by a Celeron processor, the N3050 which currently ranks #1595 at cpubenchmark.net. Do you flip for Chromebooks? *insert canned laughter here* If so, the brand new 10-inch ASUS Flip Chromebook, model C100PA-DB02, is now in-stock and ready to ship to your door for $260 with free shipping at Amazon.com by Amazon actual. This is ChromeOS’s answer to tablets and Windows 2-in-1s. It has a touchscreen and the screen flips but does not detaches. It is a 10-inch 1280 x 800 IPS display. The screen has the usual modes of this design, the conventional laptop, the screen-front (aka Stand mode), the Tent mode (no juvenile jokes please! ), and the tablet mode where the keyboard folds under the display making it a think faux-tablet. Other specs include 4GB of RAM, quad-core processor, 16GB on-board, two USB 2.0 ports, microSD, microHDMI, with up to 9 hours of battery life.